Great saving when you buy 5 or more Kitchen Units. Shop a wide range of doors and windows today. Included in this deal are Internal and External Doors, Garage Doors, Conservatory Doors and Windows and much more. Avoid wasting money by giving someone something they don't want, buy Wickes Gift Vouchers so they can buy exactly what they do want! Where do I use my Wickes voucher code? Select the code you wish to use and copy it. Follow the link to Wickes website. When you are ready to place your order, click ‘Checkout’ at the top of the page. Sign in to your account, register a new one or choose to checkout as a guest. Enter your delivery details, choose your preferred delivery date and select a convenient time slot. On the right-hand side of the screen under the order summary, you can enter your voucher code into the 'Add a voucher' box. Click 'Apply' and your discount will be applied to your order total. "Take advantage of 3 for 2 offers by stocking up on a spare tin of paint or an extra roll of wallpaper. It’s great to have a backup should you want to freshen up your decorating." Wickes is the ideal one-stop shop for builders and DIY enthusiasts, offering a comprehensive range of construction and home improvement products at very competitive prices. They manufacture and sell their own brand of products, which helps to keep costs down but also offer some of the best and most trusted brands featuring Stanley, Bosch, and Makita. 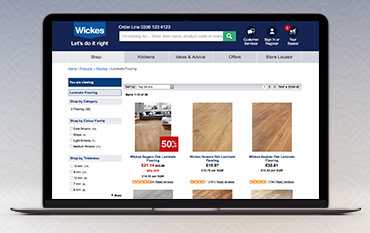 You'll find everything you need for your latest DIY project at Wickes including kitchens and bathrooms, flooring, doors and windows, paint, tiles, timber, fence panels, tools and much more. They have regular money saving offers online and their website also contains a range of useful "how to" guides. When it comes to DIY, there are few names as big as Wickes so be sure to check out their collections today! If you could do with a little inspiration then browse through the Good Idea Leaflets and free downloadable brochures to get your juices flowing, and there’s plenty of how-to videos illustrating the finer points of handiwork to make your projects quick and easy. You can also book a session with a professional design consultant for expert advice, and check out the suggestions in the online buying guides for tips on what’s best for your home. If you just need special tools for a short-term project then be sure to check out their offers on tool hire, and their advice on energy saving tips is well worth a read, too. Kitchens from Wickes include Contemporary, classic and traditional styles. With a choice of 28 kitchens on offer, you are sure to find something to suit your taste and budget. Ready to fit kitchens offer fantastic value for money and are delivered to you conveniently flat-packed and ready to assemble. All cabinets have been created to be as hard wearing as possible, so your kitchen will look great for years to come. Their Blum hinges and drawer systems are made to close softly and are guaranteed for a lifetime. The website offers lots of advice and design ideas to help you to create the kitchen of your dreams at a great value price. If your house is in need of a touch up, you can find the best quality paint at Wickes who aim to bring the latest trends and the greatest choices. With 164 colours to choose from, you will be spoilt for choice! Whatever your requirements you can find everything from floor paint, tile paint, interior wall and ceiling paint, kitchen paint and so much more. Give your home a new lease of life with a fresh lick of superb quality paint from Wickes! Use one of our discount codes and you could save an extra bit a cash on your next DIY job! There are 28 fabulous bathroom ranges to choose from at Wickes, so you really will be spoilt for choice when choosing your next interior bathroom style! The bathroom packages, include the bath, sink and toilet and are a great way to save money. But, you can also pick and mix from the full range of products which includes, freestanding baths, shower baths, pedestal and wall mounted basins and vanity units, showers and wetrooms, close coupled and wall hung toilets and a huge range of accessories. Bathrooms from Wickes are made to last with up to a 25 Year Guarantee on pottery and a 10-year guarantee on taps. Are online prices the same as instore? Yes, with the exception of promotional offers and exclusive online discounts, prices of products on the website match the in-store price. Wickes aim to get all refunds fully processed in up to 14 working days from the point when you notify us of cancellation, however, in most situations this is processed a lot quicker. Yes. The Wickes highly experienced installation team can be booked when you order your showroom kitchen or bathroom. All installations come with a 2-year workmanship guarantee. As one of the UK’s leading DIY stores for home improvement, painting and decorating, building projects and DIY jobs both big and small, it’s no wonder Wickes are amongst the best in the industry! They stock a huge range of tools and building materials suitable for all DIY projects including all the essentials such as floor tiles, laminate flooring, loft insulation, heating & electrical fittings and so much more! Make sure to use one of our Wickes voucher codes to save money on all you DIY essentials at Wickes. We are constantly on the hunt for first order Voucher Codes for Wickes to help you with your money saving. Our experts check dozens of sites for secret codes including NHS discounts, student sites & social media channels saving you time & money!